FIFA 10 is the highly anticipated sequel to FIFA 09, and the newest member of the EA Sports family … and it’s here, at long last! The main ambition of David Rutter and his EA Sports team was to improve the game as much as possible on and off the pitch, whilst also keeping most of the core features that FIFA 09 had – and I think it’s safe to say it was a success. 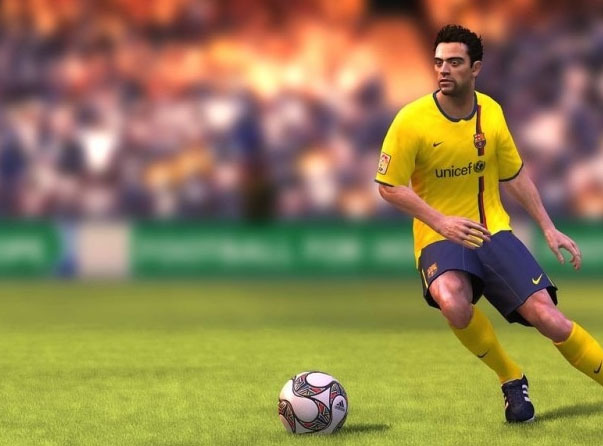 FIFA 10 concentrates on the tiny details, and rather than making any huge changes from FIFA 09, it has tweaked what needed to be tweaked and nothing more. But these small changes do make a huge difference. 360-degree dribbling is one of the many changes that make FIFA 10 – it gives you much greater control over your player’s movement. It’s such fun to use, and you’re able to beat your marker in a heartbeat if you play your cards right, and this is without using any skills at all. There’s also the skilled-dribbling feature that you can use (by holding L2 and running), which allows you greater ball control, and if your player is particularly skillful (i.e. Messi, Torres, Ronaldo) then your opponent will have a very hard time getting the ball off you. Be A Pro (BAP) has also improved greatly. With the new game sub-mode called Virtual Pro, you’re able to create yourself down to the very last detail – or even upload your own face to put on your player if you don’t feel like tweaking any of the many customisable features. Once you’ve created your Virtual Pro, you can get on with trying to achieve your targets, which in turn will add to your skills, or unlock certain items for you (new boots, shirt untucked, long sleeves). You can achieve these targets by completing relatively simple tasks – there are some which require you to simply bury a laces shot in the arena, or others which require you to take the ball past your man 5 times, or play 200 VP matches. Virtual Pro also has a major influence on the online Club Mode too. Rather than playing as the normal players of your team, you and your friends’ VP players will be playing instead. If you don’t have 10 people playing, then FIFA will randomly make up 10 players with a 60 overall stat to fill in the gaps. This may sound harsh, but it’s definitely a masterstroke by EA. By doing this they’ve eliminated the problem that was everybody picking 5-star teams with elite players. Now people can go the team they want to go rather than the team they have to go, and everybody starts on a relatively even playing field. Not to mention, if your Pro eventually earns an 85 or 90 overall stat, then there’s definitely a great sense of achievement knowing you’re one of the best on the field! The regular online play has also had filters added to it – so if you don’t want to play a certain team, or want to play someone closer to your level in “instant” online ranked matches, this is now perfectly possible. Manager Mode has also been improved in FIFA 10, and what will be most noticeable is the fact that the CPU tends to go for more realistic transfers, rather than far-fetched ones. That, and the ability to be able to pick your players’ numbers rather than have them auto-assigned, is a huge improvement in itself for the game. Going on to the animations & AI, and they’re just incredible. The way the players wrestle for the ball side-by-side, or the way you have a much greater control over the way you slide-tackle just sends a chill down your spine. If there’s a player out of position when you’re in a match, the AI will respond and try to get someone back (or forward) to cover him. The goalkeepers have better positioning and a much greater reading of the game too – I’ve seen them make double-saves time after time … but that doesn’t mean they’re unbeatable! Long balls don’t hang around in the air for half an hour before reaching their target any more, the passes are smoother, the crowds are more realistic, the stadiums look amazing, I could go on and on. But I wont, I’ll let you see for yourself! So has FIFA 10 lived up to the hype? Definitely – and then some.